George Ferguson Wilson established ‘The Oakwood Experimental Garden’ at Wisley in 1878, and it soon became renowned for its collection of lilies, gentians, Japanese irises, primulas and water plants. He died in 1903, and Sir Thomas Hanbury bought the estate, and presented it in trust to the Royal Horticultural Society. Under their stewardship, the range of gardens was enlarged to incorporate a canal; a rock garden; summer garden; winter garden; a fruit field, glasshouses and an arboretum; alpine gardens, and model vegetable gardens. The Pulhams collaborated with Edward White – son-in-law of H E Milner – on a number of projects around this time, including Gatton Park – only about 18 miles from Wisley – and Ardross Castle, in Scotland. James Pulham and Son were awarded a Silver Cup for their construction of these gardens. The rock garden at Wisley is constructed from natural stone, rather than Pulhamite. This has made it possible to move them around on a number of occasions since they were first laid, but they still retain the same basic character today. 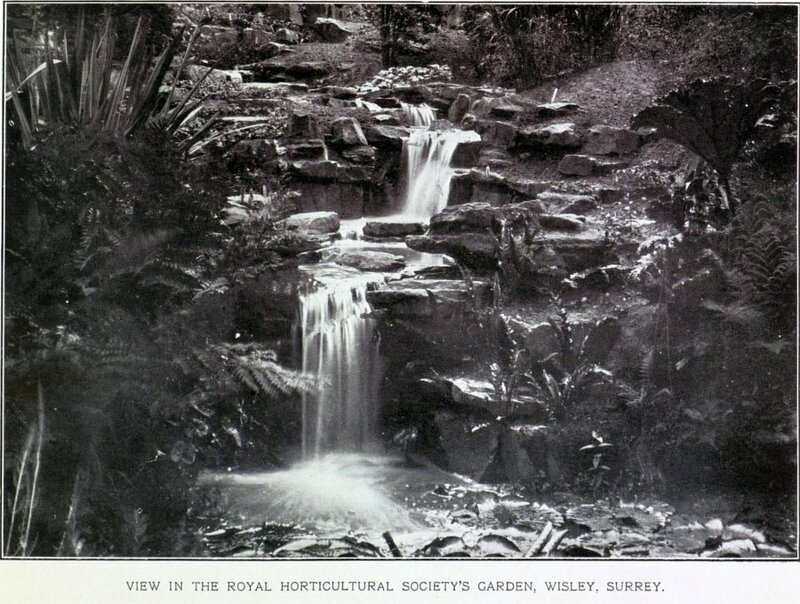 A full description of the work done by James Pulham and Son at RHS Garden Wisley – together with a number of pictures – can be found in Chapter 35 of Rock Landscapes: The Pulham Legacy – the critically-acclaimed and lavishly illustrated definitive story of the lives and work of James Pulham and Son. Written by Claude Hitching, with featured photography by Jenny Lilly. Published by Garden Art Press. Posted on October 7, 2014 June 30, 2016 by Claude HitchingPosted in Book ContentsTagged . . James Pulham and Son, Claude Hitching, edward white, George Ferguson Wilson, H E Milner, Oakwood Experimental Garden, RHS Garden Wisley, Rock Landscapes: The Pulham Legacy, Royal Horticultural Society, The Oakwood Experimental Garden.